One of our many picnic lunches with a movie. This began in December when I made it a mission to get all of our Christmas movies watched. The kids know they can get me with requests of PBS Kids or a Disney movie. Know what I love most about breaks from school? It usually means I get to have past daycare kids come back. The same kiddos that were raised with my three. Sure the days are, well, insane, but they are amazing. There's something to be said about those friendships. Not only have the kids known each other all or most of their lives, but I've known them just as long. I can tell (or know beforehand) when something will upset them, I know their personalities, and they know those same things about me. Spending days and years together does that. Much like other school breaks, I had a handful of kiddos back during this year's spring break. Now, for those of you who don't know this, kids are just generally worse for their mothers. They tend not to listen, get into trouble, scream, throw fits, argue. You (probably) know the drill. My kids are much the same. While that has gotten better as they age, it was very true when they were toddlers and preschoolers. The day the kids realized playing with the water guns was no longer off limits (as long as everyone agreed to play). They were playing sniper tag.....I was unclear on the rules, but everyone was happy and laughing. The days when my kids were a big part of the daycare were some of my most challenging times as a parent and daycare provider. I laugh now about the times when I had to call my mother-in-law to come pick up one of my kids because they were leading the latest rebellion at daycare and I couldn't take it anymore. This was back when Hubs was the one working the longest hours and I was the primary care giver (my how things have changed in that regard!). I do have fond memories of those days though. I remember the fun times and also how strict I was with a lot of things (hello, TV time anyone?). I know I've loosened up over the years. Maybe it's been my kids getting older and I haven't been as stressed with them now that they're all in school full time. Maybe it's because I've just spent so many years with kids now that I'm pretty lax with, well, everything. Maybe it's my own long hours working that made me loosen my grip in otherwise tight places. Whatever it is, I know I'm not as strict as I once was. I didn't really think about how "loose" I've gotten until last week. One of the littles came up to me and asked to do something. "Of course, go for it!" I replied, as I turned around and finished whatever it was that I was doing. I had four bigs looking at me, mouths opened. "Why are you letting them do that?" one of them asked, as she eyeballed the little who was already onto the next best thing. "Because they can..." I truly wasn't understanding why she was so confused. That's when my middle child spoke up. "You NEVER let us do that mom!" All of the bigs agreed in unison. They then took the time to point out all of the things I let the kids do now that was a hard no when they were "little and here for daycare everyday...well, at the old house." The more I think about, the more I see what they were saying. I find myself saying yes far more than I say no to random requests. I find myself laxer in our daily routines. You want to push lunch back because you're not ready to stop playing. Fine, request granted. I don't really do time outs anymore (although I'm lucky because I don't really have to with my group of kiddos) and we do "think about it" time now. 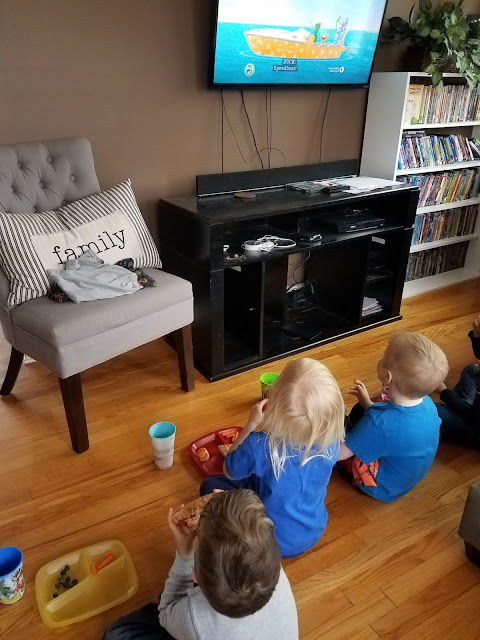 I laughed at the end of last week when the kids requested yet another picnic in the living room lunch so they could watch PBS Kids and I said, "of course we can!" Picnic lunches were few and far between back in the early daycare days. Moral of the story, I'm a pushover daycare provider these days who can be talked into picnic lunches, mud kitchens, new toys, desserts after lunch, and so much more. 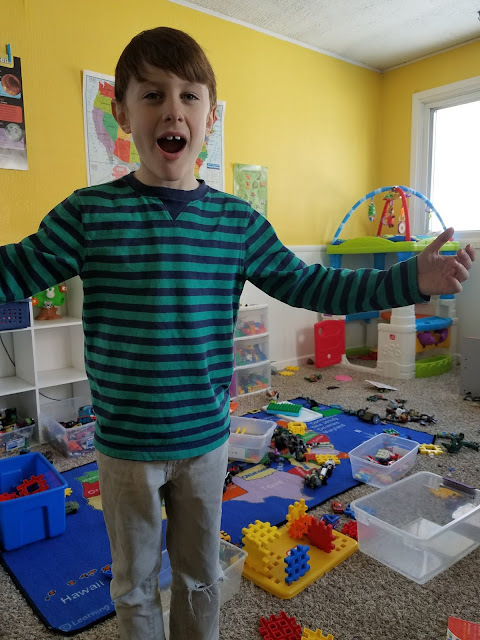 I do think my kids not being around all day every day and being much more independent (and much less demanding of me) has a lot to do with my newfound looseness. It's not just my daycare provider style that has changed either. My parenting style has definitely loosened up throughout the years as well. I must say, I'm okay with both. 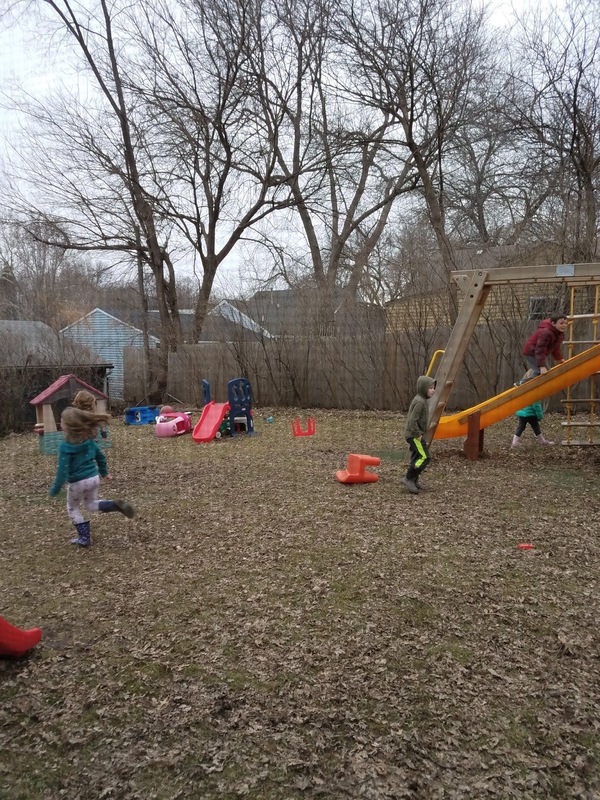 Because I'm happy, daycare kids are happy, and my kids are happy. And at the end of the day, that's all that really matters. The day I told the kids not to worry about cleaning up before lunch. That has only happened a few times, but enough to make the middle mini exclaim "what the heck?" and question my provider ways.